Two idiots. Three chairs. Some lights. No script. 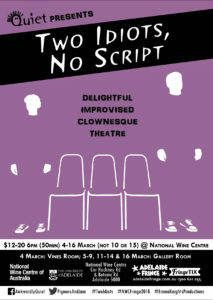 Delightful, improvised, clownesque theatre. We invite you to glimpse into worlds, peculiar and mundane, inhabited by vulnerable weirdos. Lizzy and Andreas met at The Second City, Chicago and are now teaching and performing together internationally. Emerging from the players’ shared love of calm, simple, organic improv, Awkwardly Quiet is equal parts emotional connection and big dumb fun. The performers revel in playing silence and exploring the potential in every moment, creating a show that varies from conversational to silent space play, and from the dramatic to the absurd. Awkwardly Quiet is international duo Lecoq-trained actor Andreas Södermark (SWE) and award winning comedy performer Lizzy Mace (UK). Already experienced performers, they met in Chicago at The Second City in 2013, and are now teaching and performing together internationally. Andreas trained in the Lecoq tradition – physical theatre/clowning – at The School For Theatre Creators in USA and Italy, where he also completed The School’s individualised pedagogical training. Lizzy trained in acting at Mountview Academy of Theatre Arts in London, and has received 4- and 5-star reviews at the Edinburgh, Adelaide and Brighton Fringes. Her show Rom Com Con (with Mace and Burton) was picked by SA Life Magazine as one of their top nine shows at Adelaide Fringe 2014.